Distance between the crowns of assembled mandrel balls. (Note the different pitches in the photograph to the right.) Ideally, the higher the wall factor — i.e., the ratio of tube diameter to wall thickness — the closer the pitch, because thinner walls of a given tube diameter require more points of support, as provided by the crown of ball, over a given distance than do thicker walls of the same tube diameter. (This is the same reason why the mandrel nose radius should decrease as the wall factor increases.) However, H-type link design, which is the most common type of link used in mandrel assemblies, does not allow pitch to be precisely adjusted to a particular wall factor. Instead, pitch must change in intervals, because H-type link length, which determines the distance between mandrel ball crowns, is fixed. These intervals are commonly termed “regular pitch”, “close pitch”, and “double-close pitch”. Each standard H-type link length, or size, is designed to provide optimal support for a certain range of tube diameters at wall factors less than 40-45. The pitch resulting from this is known as regular pitch. 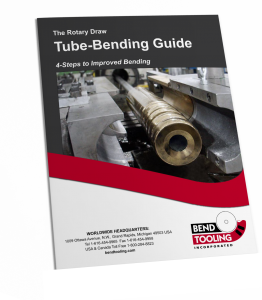 A close-pitch mandrel assembly is typically recommended for uses links applications ranging from 40 to 70 wall factor and uses links one size smaller than would be specified for a regular-pitch mandrel. A double-close pitch mandrel, 60 to 90 wall factors, uses links two sizes smaller than regular pitch.